HOUSTON, TX (June 2015) – The national law firm of Chamberlain, Hrdlicka, White, Williams & Aughtry again has earned top rankings in two leading legal ranking publications, The Legal 500 and Chambers USA. For the eighth year in a row, Chambers & Partners ranked Chamberlain Hrdlicka as one of the top tax controversy law firms in the United States. Attorney David D. Aughtry of the firm’s Atlanta office also was recognized as one of the top tax attorneys in the United States. Aughtry is one of seven attorneys from the firm’s Houston, Philadelphia and Atlanta offices to be listed by Chambers & Partners in the 2015 edition of its annual Chambers USA guide to the world’s best legal professionals and law firms. The Legal 500 nudged Chamberlain Hrdlicka higher in its tax controversy ratings in 2015, placing it in the company of AM Law 100 firms such as Morgan Lewis, Mayer Brown, and McDermott Will & Emery. With about 120 attorneys and 44 shareholders, Chamberlain Hrdlicka recently posted double digit increases in net income and profits per partner for 2014, evidence of significant growth in practice areas from litigation to intellectual property and energy. 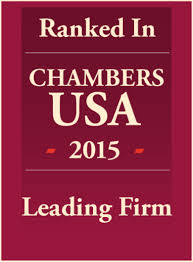 About Chambers USA - Published by worldwide legal ranking guide Chambers & Partners, Chambers USA is an annual list of the top attorneys in the United States according to practice area. Designed as a comprehensive guide for clients, the publication identifies and ranks leading law firms and attorneys based on thousands of interviews conducted by researchers with clients and lawyers worldwide. About The Legal 500 - For 27 years, The Legal 500 has been analyzing the capabilities of law firms across the world, assessing the strengths of law firms in 106 jurisdictions. The Legal 500’s research is based on feedback from 250,000 clients worldwide, submissions from law firms and interviews with leading private practice lawyers, and a team of researchers with experience in the legal market. About Chamberlain Hrdlicka –Chamberlain Hrdlicka is a diversified business law firm with offices in Houston, Atlanta, Philadelphia, Denver and San Antonio. The firm represents both public and private companies as well as individuals and family-owned businesses across the nation. In addition to tax planning and tax controversy, the firm offers corporate, securities and finance, employment law and employee benefits, energy law, estate planning and administration, intellectual property, international and immigration law, commercial and business litigation, real estate and construction law.